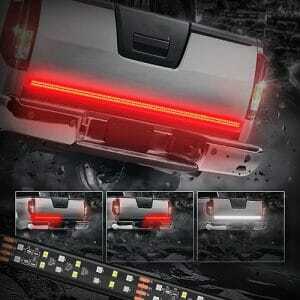 If you’re familiar with trucks or towing equipment, you’ve probably heard of tailgate light bars. 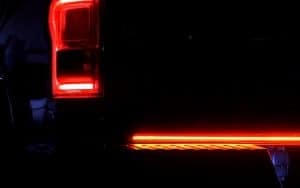 They are LED strips, usually found in the space between a pickup truck’s door and the rear bumper. When plugged into the vehicle’s battery, the lights work in tune with other rear flashers, broadening the visual of turning and reverse lights. Below, take a look at five of the best tailgate light bars sold anywhere, then check out the buyer’s information that follows to help you finalize your purchase. 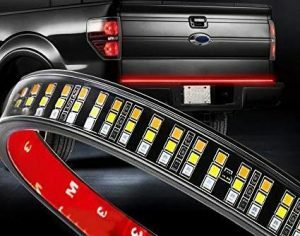 All the benefits and drawbacks will be analyzed in detail so you’ll know exactly what to expect before your light bar is shipped. 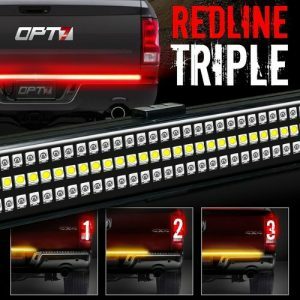 The OPT7 60″ Redline is a basic setup that includes three rows of LED lights, turn signals, and a reverse indicator. Turning acceleration, the red lights are stable, brightening slightly at the same time as your ordinary lights. Amber-colored turn signals can be seen from a long distance and offer a good brilliance to having ordinary flashers that only blink red. And the reverse indicator is white, flashes quickly whenever you reverse your truck. If you don’t want to use the adhesive, you can drill holes into your vehicle; the tape is strong but tends to wear away quickly. Metal clips also are included but it’s best to use them with the tape itself for stronger support. After installation, you might encounter a delay in the turns signals as well. To avoid this, try to make the connectors as tight as possible, which isn’t always easy to do since four ping outlet must be plugged into the same slot reserved for tows. The wires will stick out, and a separate covering must be purchased to avoid any loose hanging cords. Anyhow, the OPT7 60″ Redline remains one of the best bars for ease of setup and is recommended to for anyone who doesn’t want to spend too long getting the adhesive and brackets attached. Going slightly smaller, the OPT7 60″ Redline LED is much like the previously reviewed product but doesn’t feature three rows of lights. Instead, there’s just one long strip, equally as bright and built with lots of useful features to help lengthen the time it stays on your truck. Weather often is a big factor in determining to the type of LED lights users will gravitate to purchasing. Lights that don’t have any protective exterior will break, especially in rainy or snowy conditions. 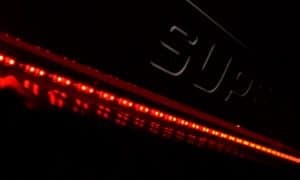 The Redline is manufactured with a silicone covering on every LED and going down the entire strip. This also prevents dirt from building up inside. If you don’t park your truck in a garage, This might be one of the best light bars, especially if your pickup is suitable for a 60-inch. But there’s still lots of room for improvement. If your truck is mostly used for loading and unloading materials, there’s high chance that the adhesive will become eroded if anything makes contact with it while the bed is open. Place a sheet or other covering around the LED as a preventive measure. And the turning signals could possess a delay of occasions. If it does happen, it’s usually just a second delay, but you might not even notice. 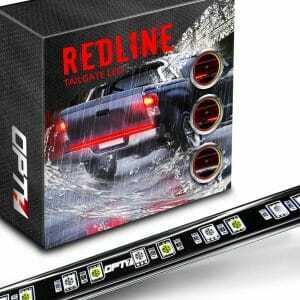 In any case, the Redline remains a top choice for trucks that can fit 60-inch light bars. Although there are not amber lights this go-round, the red flashers could accent the color of your vehicle better. The Ambother NI-04 maxes out at 48 inches, so if your pickup is a little smaller, this might be the perfect product for you. It’s one of the best for moderate-sized trucks. 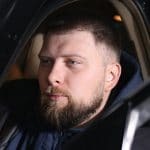 Setup is pretty straightforward but you will have to pay attention to how placement goes into your power connector. The left, right, and brake lights each have their own individual slots designated to go into the outlet. It pretty easy but there are photo instructions that detailed where each piece goes. Although there is adhesive sold, you will certainly have to use brackets with the light bar. This could be problematic too since they don’t reinforce the strip securely. You might be forced to hardwire everything. If so, there are no instructions available. If you’re not familiar with how to do it, check out this useful video explaining how the setup works. Again, the NI-04 is recommended for consumers looking for light bars of at least 48 inches, and although not perfect, performs well at giving your truck better visuals in clear of foggy/rainy conditions. The DJI tailgate bar resembles a single-row LED configuration but has three rows instead of one. The 60-inch bar will fit perfectly on the ordinary and sports pickups, so consider this as an alternative to the aforementioned OPT7 series. Every signal is set at a different brightness. If turning signal luminosity is important to you, they are very easy to see and are colored as amber. When you’re ready to install, give yourself some time, however. The mounting bracket is a little troublesome, if downright annoying. There are washers included with the setup, of which must be placed carefully through the nuts, an alignment that’s not very easy; the nuts are built into the bar and cannot be moved. And although the lights work as advertised, they aren’t as bright as one might expect. And peeling along the black edges is common in environments that are prone to receiving inclement or humid weather. While not a temporary light fixture, you’ll probably end up needing a replacement unless your vehicle isn’t parked outside when not in use. Overall, the DJI is a solid purchase for anyone that has a sports pickup wide enough for a 60-inch light bar. If you wanted, you could also place it in the front of your truck and use to reverse lights (white) for added illumination towards the nose. While three and single-row LED lights have been reviewed, the Mictuning 60-inch LED finalizes with strong protective features and great luminosity. When your vehicle is being driven, you’ll keep potential tailgaters far away from the bumper since the lights are very bright. In fact, they may sometimes appear to outshine your ordinary tail lights. They are designed for all weather. If you reside in warm or cold regions, the bar will take on little to no wear for a long time. Place it on the front (or rear) if you’d rather use as a running light for a little decoration. This unit is specified to run for at least 100,000 hours, so it’s likely that the lights will be on your vehicle for a very long time. They also look great on some ordinary automobiles, so if you do own a sedan, check to see if they are compatible with your vehicle. For all others, trucks will look much more sophisticated once they are installed. However, you might run into problems with the reverse lights. Even with proper installation, there have been reports of the LED’s having a delayed signal or even failing to light up. This could be faulty wiring, try to purchase an adapter and connector. That way, all wires will be hidden and free from exposure to the elements. And while they are good for rainy weather, you might notice moisture in some of the lights, especially after heavy downpours. Still, Mictuning has made a fine product that’s great for almost any sort of pickup, flatbed, or cargo trailer. 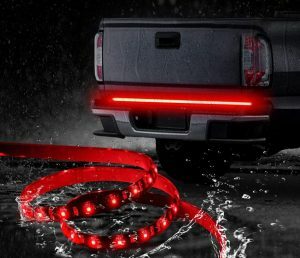 LED tailgate lights are made for all sorts of vehicles. The longer varieties such as those reviewed are best for trucks and other towing-style equipment. Prior to settling on one product, consider these important tips that could help you find the light bar that’s best for your vehicle. Tailgate light bars for trucks are often sold at sizes that measure anywhere from 40 to 70 inches. While 70 inches is seen less often, they do exist. Most averages sized LED’s top off at about 60 inches at most. The majority of Dodge Rams, Fords, and Toyotas all will fit under this specifications. It’s still a good idea to measure the edge of your bed before you acquire. Just look through the specs of your truck and see the length of the bed. If it’s more than 60 inches on the inside, then you should have no issue with size during installation. If unsure, use a measuring tape to gauge the rear of the truck, paying attention to the gap that’s between the bumper and the liftgate. On most vehicles, this is where you’ll place the tailgate bar. If that’s under 60 inches, you’re good to go. Light bars often come in rows of either 1-3, with LED lights covering the majority of the bar itself. They are flexible and operate in the same manner. Most of the differences lie in the level of brightness generated. One row – One-row tailgate bars will have a set of red and white lights that sit parallel to the next fixture. Amber colored lights can also be included with them but they remain in the same row as the other lights. As the lights are displayed, there will be more space in between the LED and the dark area that separates them. But if the light is brighter, you won’t notice this too much. 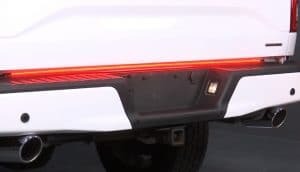 If you want something that glows at a rate that appears to be a straight line going down the bumper, you’ll find lights with at least three rows more capable of achieving this effect. Two row – Two-row bars have a dual-row setup, with some companies making one of the rows exclusive for reverse lights only, or the white lights. Others may designate a row for turning signals. If you want your turning signals to flash in an amber color, pay attention to the hue displayed on the product’s photo. If you see a strip from the row that’s in line with this color, then it should be included. Amber lights are hardly ever used for anything but turning signals. Regardless, two-row bars are a step up from single rows and can be used alternatively for a simple decorative display, if desired. 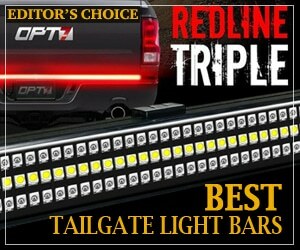 Three row – Three-row lights are the most popular for tailgate bars. They will have triple the brightness of single rows and oftentimes match up in brightness to your factory rear-view tail lights. Some models might be a tad bit longer in height but most have no size issues with the average truck. Three-row lights can feature anywhere from one or three color combinations. Most, like any tailgate light, offer two; red for braking/turning and white specifically for backing up. If your pickup is large or you live in an area that receives dense fog or heavy snow in the winter months, three rows are the best choice. Installation is not as difficult as it may appear. Essentially, you install tailgate lights in the same manner that towing equipment is hooked to your vehicle. 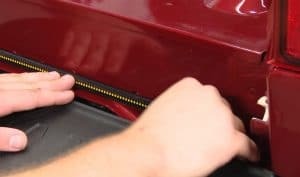 As mentioned, all light bars are sold with a four pin connector that attaches to the towing equipment. Each individual plug will indicate what slot it’s supposed to go inside. If you’re not completely sure, just refer to the instruction manual; most light bars will tell you how to do this part. Make sure the surface you’ll place the adhesive on is completely clean and free of any dirt or moisture or you could run into problems with it staying on. Take off the paper that goes over the adhesive and press the fixture onto your truck. As you’re plugging in the connectors, you’ll notice that the wires must protrude outside in order for you to attach. If you want to change this, you should look for a splitter that will allow you do fasten everything from behind the bumper. When you’re finally ready to decide on the light bar you like the most, remember the picks that were given, starting from the top two. Of them, the OPT7 Redline brand is the best. Specifically, they are the Triple and single LED brands, with the former being the most recommended of all. Both offer the high brightness and string durability. And even though it’s sister has a single row, the LED’s placement gives off more luminosity than lower quality three-row brands. The sizes are great for a majority of trucks and tows. As indicated in the buyer’s section, size and craftsmanship are an important aspect for all light fixtures. But no matter what choice interests you from the list, you’re sure to end up with a light bar that makes your truck stand out from yards away. Thanks for the review, i bought the opti 60″ & are very pleased. 1 question, is there any reason canned silicon spray couldn’t be applied to reinforce the weather capability?